Pour the blueberries into a strainer, rinse with water, and shake off excess water. Spread the berries out onto paper towels to dry slightly. In another bowl, whisk milk and pudding mix for 5 minutes; let stand for 2 minutes or until soft-set. In a deep, clear glass bowl or trifle bowl, spread a layer of pound cake chunks. Scatter the cake with chopped strawberries in a thin layer. 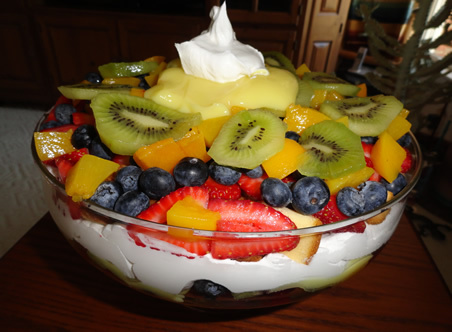 Sprinkle the strawberries with a layer of blueberries, followed by a layer of diced peaches, then kiwi slices and top with half the pudding. Dollop a layer of whipped topping, then repeat layers until all cake and fruit has been used. Finish trifle with a layer of whipped topping. Cover the trifle, and refrigerate until chilled, about 1 hour. **You can add a splash of your favorite dark rum to the pudding mix to give it extra flavor.